Now available in beautiful gift edition, 90 Minutes in Heaven is the runaway bestseller about one man's experience with death and life. As Baptist minister Don Piper drove home from a conference, his car collided with a semi-truck that had crossed into his lane. Piper was pronounced dead at the scene. For the next 90 minutes, he experienced the glories of heaven, where he was greeted by those who had influenced him spiritually, and he experienced true peace. Back on earth, a passing minister who had also been at the conference felt led to pray for the accident victim even though he was told Piper was dead. Miraculously, Piper came back to life. For years Don Piper kept his heavenly experience to himself. Finally, friends and family convinced him to share his remarkable story. An inspiring and encouraging account, 90 Minutes in Heaven continues to touch and comfort millions of people around the world as it offers a glimpse of inexpressible heavenly bliss. This makes perfect gift of hope for those struggling to understand a tragedy or loss of a loved one. - Publisher Simultaneous with my last recollection of seeing the bridge and the rain, a light enveloped me, with a brilliance beyond earthly comprehension or description. In my next moment of awareness, I was standing in heaven. On the way home from a conference, Don Piper's car was crushed by a semi that crossed into his lane. Medical personnel said he died instantly. While his body lay lifeless inside the ruins of his car, Piper experienced the glories of heaven, awed by its beauty and music. Excerpted from the runaway bestseller 90 Minutes in Heaven, this beautiful gift edition focuses on the reality of Piper's heavenly experience. A perfect gift of hope for those facing the loss of a loved one, this book will also comfort those nearing the end of life. 90 Minutes in Heaven is changing millions of lives. Let it change yours too. Don Piper has been an ordained minister since 1985. His story has been covered by national media outlets including Newsweek, The Today Show, The 700 Club, At Home Live, and TBN's Praise the Lord. Piper leads conferences and retreats throughout the United States and abroad. Cecil Murphey has written or coauthored more than 100 books, including his work on the autobiography of Franklin Graham, Rebel with a Cause. About "90 Minutes in Heaven (Gift Edition)"
Simultaneous with my last recollection of seeing the bridge and the rain, a light enveloped me, with a brilliance beyond earthly comprehension or description. In my next moment of awareness, I was standing in heaven. On the way home from a conference, Don Piper's car was crushed by a semi that crossed into his lane. Medical personnel said he died instantly. While his body lay lifeless inside the ruins of his car, Piper experienced the glories of heaven, awed by its beauty and music. 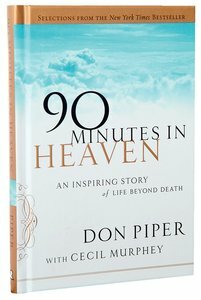 Excerpted from the runaway bestseller 90 Minutes in Heaven, this beautiful gift edition focuses on the reality of Piper's heavenly experience. A perfect gift of hope for those facing the loss of a loved one, this book will also comfort those nearing the end of life. 90 Minutes in Heaven is changing millions of lives. Let it change yours too. Don Piper has been an ordained minister since 1985. His story has been covered by national media outlets including Newsweek, The Today Show, The 700 Club, At Home Live, and TBN's Praise the Lord. Piper leads conferences and retreats throughout the United States and abroad. Cecil Murphey has written or coauthored more than 100 books, including his work on the autobiography of Franklin Graham, Rebel with a Cause. Don Piper has been an ordained minister since 1985 and has served in several capacities on church staffs, including six years as a senior pastor. He has appeared on numerous television and radio programs and has been the subject of countless newspaper and magazine features. He is the founder of Don Piper Ministries and is a popular speaker across the United States and abroad. He and his wife, Eva, are the parents of three grown children and live in Pasadena, Texas.